I had a tragically happy childhood, I say tragically because I believe this is probably a disadvantage for a writer. What were my parents thinking? How dare they be supportive and loving! Where was the divorce and misery, the alcoholism or violence?—things I could draw on as a writer?! So, for this reason I found it a bit tricky to decide on just one ‘best’ childhood memory. I could’ve chosen playing under the sprinkler with my sisters and the neighbourhood kids while our mums sunned themselves on banana lounges; being given musk sticks at Nan's; building sandcastles with my friend Nikki down at Killarney beach then trying to dig tunnels underneath without them collapsing; riding our bikes around & around the court where we lived; or baking scones with Nan. But instead I’m going to share a piece I originally wrote as a poem called ‘In the hospital’ but later expanded into this piece about flying a homemade kite with my Pa. I had forgotten that but you were right, you would build them just so I could knock them over. I would watch the cards tumble to the tabletop some showing their mysterious value, others displaying patterned backs in blue and white. Shoulders squared. I leant forward in the uncomfortable chair left for uncomfortable visitors. Smiled. Laughed too loudly. Nodded. I talked about the kite we built together in your shed. A memory green-tinged by the fibreglass skylight. The kite wouldn’t fly. Over and over you threw it into the air as I ran pulling the string against the prevailing wind only to watch as the kite spiralled out of control, diving into the unforgiving earth. I laughed then, as if the terrible kamikaze flight was funny, but I wanted it to soar. On one spectacular crash landing, the frame broke. You did a hasty repair and, finally, it flew. 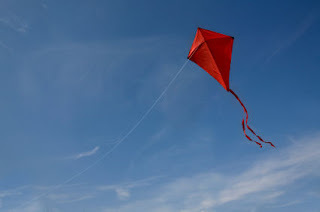 Weeks later I cried, secretly, to find out you had thrown the kite away. It was only sticks, some string and a garbage bag, but I had wanted to keep it, forever. “Anyway, ninety-one’s pretty good,” and I laughed as if you were joking, kissed your cheek and left. I walked away as if nothing was wrong, as if you weren’t trying to tell me something important. Deb - I don't know how you can call it tragic that you can write like that. If beauty could be acute enough to cut like a knife, that memory definitely would. So good. Oh Deb - you've made me smile and cry at the same time. We lost our Grandad late last year, and your poem is like a replica of how it played out for us too. Thanks for sharing - loving your daily blogs. Day 22: What do I do when I'm home alone? Day 20: What do I collect? Day 18: Where am I happiest? Day 15: Ten things that make me awesome. Day 14: What's on my iPod? Day 13: Do I have regret? Day 3: What makes me happy?